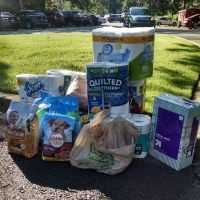 St. Margaret’s has responded most generously in our contribution of food for people and pets, paper goods, diapers, and personal hygiene items to St. Mark’s Food Pantry this summer while the children of Robinson Elementary are on summer vacation. Every week, the basket at the altar overflows with your gifts. The Food Pantry is open every Thursday, serving approximately 7,000 individuals each year.. Please continue to bring your offerings on Sundays, knowing they make a tremendous difference in the lives of needy families in central Arkansas while school. St. Mark’s receives a weekly truckload of food on Wednesdays from Arkansas Food Bank. If you would like to help with unloading, call Tricia Peacock at (901) 825-7871. In August, we will resume collection for the Backpack Program.